It’s his handshake that tells his story. His grip is strong, and his palms have been toughened by years of hoisting bags, and clients, as they scramble over the icy scree and shale. By contrast, his voice is soft, almost sing-song and puts me at ease immediately. This is Florence, assistant guide, we are told. ‘Florence will be making sure you make it up the mountain’. For some reason, I am certain the statement is aimed squarely at me, and for a moment I don’t know whether to feel indignant or reassured so I settle on a combination of the two. 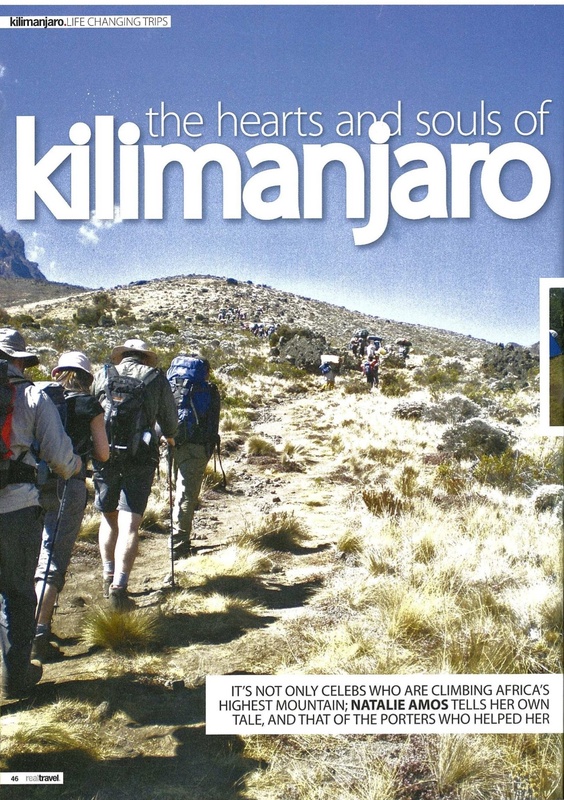 Kilimanjaro is affectionately called the ‘Roof of Africa’ for one reason. Her highest point, Uhuru Peak sits in splendid isolation, bathed in clouds at some 5,895 meters above sea-level. Three miles above the level generally associated with holidays. Nowhere else on Earth is it possible to climb a mountain on such a grand scale without an ice-pick or a frost-flecked beard. I have neither beard nor ice-pick and throughout my climb I reminded myself that summiting Kilimanjaro is a test of endurance, not climbing ability. I prepared for the trip for two months, but some of my fellow climbers had been preparing mentally, as well as physically for over a year. Cardio-vascular workouts in the gym as well as long walks were highly recommended to get me into peak condition. Whilst you do not have to be hugely fit, physical wellness is essential. 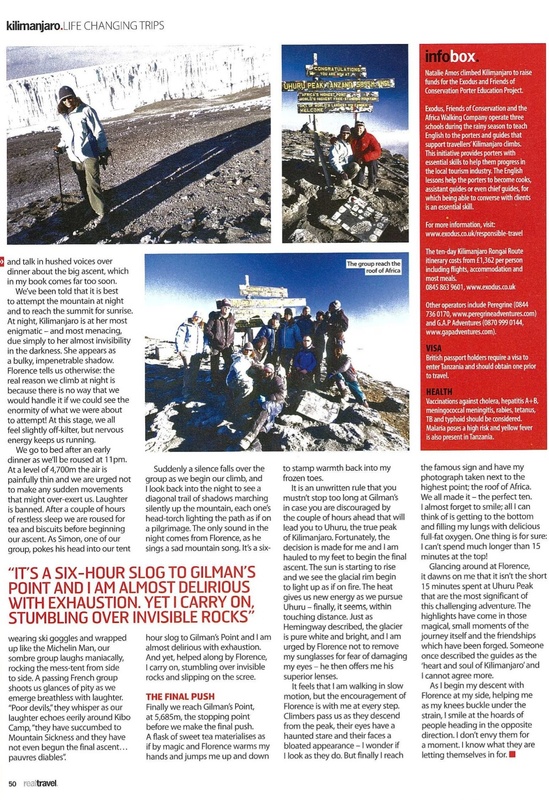 Oh, and as I found out pretty early on, those attempting Kili must really like walking… as up to 17 hours a day are spent placing one foot in front of the other! 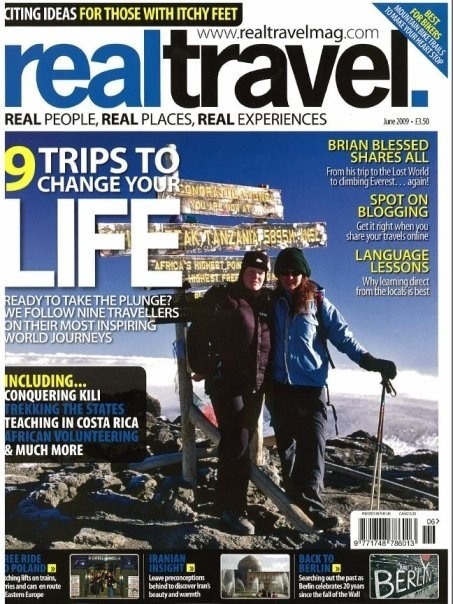 Travelling in a group of ten, each of us had our own reason to conquer the mountain. Mine was a personal ambition – part of my list of ‘things to do in my 30th year’. We were joined by a small army of guides and assistant guides, as well as an assortment of cooks and porters. 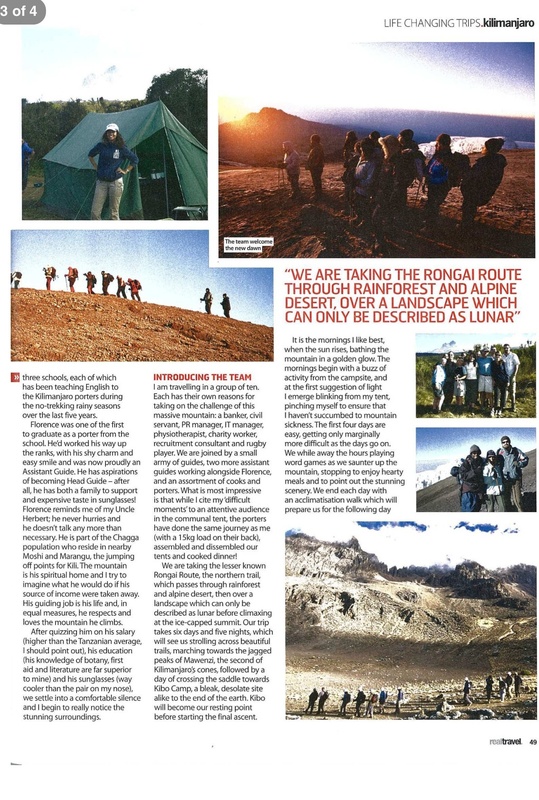 We took the lesser-known Rongai Route, the northern trail, which passes through rainforest, alpine desert, then over a landscape which could only be described as lunar before climaxing at the ice-capped summit. Minor ailments such as bruised toes, blisters and altitude headaches were all forgotten when morning breaks and the sheer beauty of the mountain is revealed. Our trip took six days and five nights which saw us strolling across beautiful trails, marching towards the jagged peaks of Mawenzi, the second of Kilimanjaro’s cones, followed by a day of crossing the saddle towards Kibo camp, a bleak, desolate site which is like the end of the earth. Kibo was our rest point before the final ascent. Finally, we reached Gilmans Point, at 5,685m, the stopping point, before we made the final push. It is an unwritten rule that you must not stop too long at Gilman’s in case you are discouraged by the couple of hours ahead before you reach Uhuru, the true peak. The sun began to rise and we saw the glacial rim begin to light up as if on fire. The heat gave us new energy as we pursued Uhuru which finally seemed within touching distance. Finally I reach the famous sign and have my picture taken next to the highest point. We have all made it – the perfect ten. I almost forget to smile, all I can think of is getting to the bottom and filling my lungs with delicious oxygen. One thing is for sure, I cannot spend much longer than 15 minutes at the top! I glance around the group of people I have spent the last week with and feel affection for them. How we’ve bonded since we’d met for the first time at the departure gate at Nairobi, bound for Kilimanjaro airport. I realise that the short time spent at Uhuru Peak are not the most significant. The highlights are the magical, small moments of the journey itself and the friendships which have been made. As I begin my descent with Florence at my side, helping me as my knees buckle under the strain, I smile as I pass the hoards of people heading in the opposite direction. Natalie Am os climbed to raise funds for the Exodus & Friends of Conservation Porter Education Project. Exodus, Friends of Conservation and the Africa Walking Company operate three schools to teach English during the rainy seasons. They also provide porters with skills to help them progress in the local tourism industry.